Peace and Happy Monday to all. Thanks, Kerfe. I tried three times and I still don’t see him there, but wanted to post an attempt, anyway. Glad you enjoyed it. Oh, I knew who it was right away. Even if it was June? Thank you. I’m glad you enjoyed. Thanks, Iris. It was my best attempt of several. Still a ways to go with his face but I’ll keep at it. I needed to acknowledge him today in some way. Glad you enjoyed! You have found your niche! Thanks Beverly! I really appreciate that. I’m enjoying this face challenge, for sure! A wonderful tribute to Martin Luther King. Thank you Laura. A good capture and a nice way to honor him. Great work! Super excellent image. Very nice and a great tribute to a great leader. Don’t worry I recognize him immediately ! Thanks, Agnes! I appreciate you letting me know that! Thanks, Teri! I appreciate you stopping by and letting me know you enjoyed it. Thank you, Jean! Sounds like a fascinating adventure. So glad you enjoyed this! Amen to your amen! Lovely likeness, Laura! Thanks so much, Teresa! Happy MLK Monday to you! Wow! So nice! What a fantastic sketch of a great man, Laura. 💜😃Really love this …and yep… likeness is there. I knew it was him before I clicked through! Thanks, Charlie. I’d like to keep trying him until I feel I’ve really captured him, but I so appreciate your encouraging words, bro. ❤ I hope you had a relaxing and creative day with P&P! I knew right away it was, although I can see that it’s a tiny bit off. Our teacher last week, when I was struggling over my portrait, told me I had a likeness, but it could be better, but before it got better, it would probably get worse…and he was right! I was so frustrated. So many kudos to you for persevering! Thx! I wouldn’t have posted this if it were any other person, any other day. I will keep trying to capture him though. Some people are just more challenging than others and a 3/4 view is also tough, I think. They are all challenging to me, no matter the orientation. And then there is the angle of their face, whether their forehead us leaning in or out. Hard! No doubt. A cool challenge to think there are millions of faces, all different. Capturing a likeness is the ultimate high, though. Very cool feeling to see eyes you recognize staring back at you! I think that’s what has me so wrapped up in it. Add animals and I’m just flying all around the room lol. Really loving faces ATM. A nod toyour way of honoring this great individual – wonderful portrait Laura! You’re doing so well! I urge you to stay with this one a while longer, work slowly, and try to bring it to a higher degree of completion. Let your darks get a little darker, particularly on the shadow edges. Way to go, girl! Thanks, Maggie, I really appreciate your advice and I just may do it. It bugs me that I posted a portrait I don’t recognize myself. The hardest part sometimes is figuring out where it went wrong. I just figured it’s off in so many places, since I can’t figure it out, that maybe I should scrap it and try again. I’ll have to reassess. I appreciate your feedback very much, as you do wonderful portraits! I recognized this portrait right off. Don’t scrap it yet. And if you feel like scrapping it, then why not just keep working on it and try some new things out? You make a really good point, Maggie. I’ve decided his forehead is too high. Not sure if just correcting that might really make a difference. I’ve found the shape of the head can be so key. 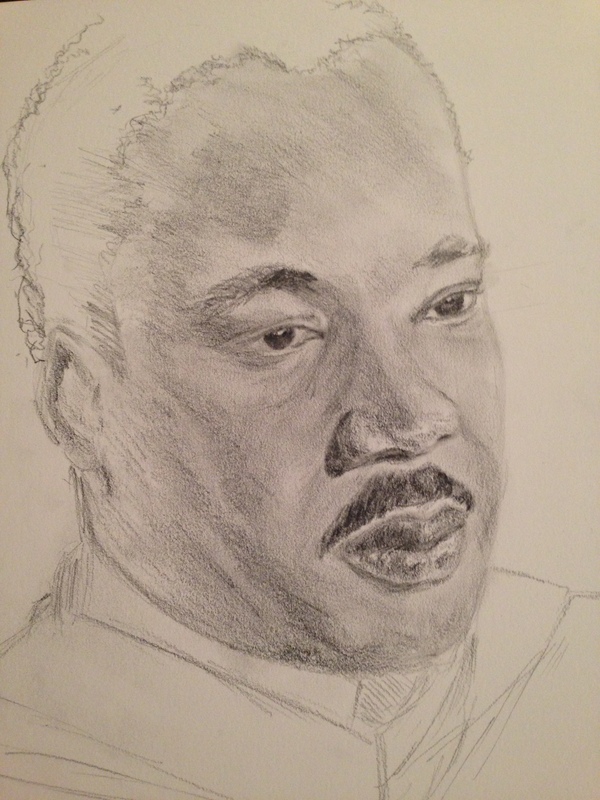 I wonder though – if I had posted this in July and not on MLK Day – do you think you’d have still seen him there? Yes, I think so. Do the measurements work out? But as my friend George Durkee says, the landscape is not your painting. Even if you don’t have a likeness, you can keep working on a drawing. mmm. I sense a blog post coming on here….